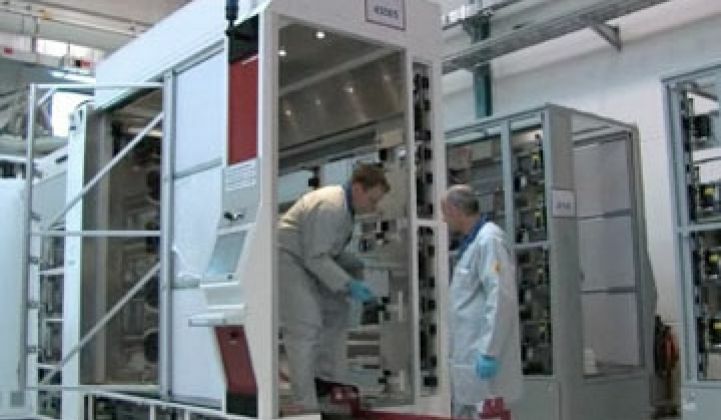 Germany’ Centrotherm Photovoltaics has begun selling equipment to make CIGS solar cells. Most everyone else has spent millions to get to that point. Has the time come for standards in CIGS? Germany-based Centrotherm Photovoltaics has developed a line of equipment for making copper-indium-gallium-diselenide thin films. Integrated together, the equipment effectively constitutes a factory-in-a-box for CIGS panels, similar to the factory-in-a-boxes produced for amorphous silicon producers by Applied Materials and Oerlikon. On Monday, it boasted that it could produce CIGS cells with 13 percent efficiency in its lab, a number that is close to what some CIGS thin-film makers claim they could do. The company also says it has customers in Asia. The promise of standardized manufacturing and the low costs it could bring will likely attract attention or, depending on your point of view, scrutiny. CIGS advocates have for years said CIGS panels could provide more power than other thin films but cost less than crystalline silicon. Lab results have shown CIGS cells converting close to 20 percent of the sunlight that strikes them into electricity. Unfortunately, moving from making small prototypes to mass manufacturing CIGS has bedeviled startups, multinational giants and national laboratories alike. The copper, indium, gallium and selenide inside CIGS cells recoil against each other, causing an unusually high number of defects and low-performance cells in early manufacturing runs. Other hurdles, such as keeping the moisture out to prevent corrosion to the cells, also can be tough to overcome (see Solar on a Budget: NuvoSun Hits 11.8 Efficiency with CIGS). Companies such as Nanosolar, Miasole, Global Solar and Solyndra all take different manufacturing approaches to making CIGS modules. These companies have raised hundreds of millions of dollars each to make their technologies work in commercial production. Most CIGS companies have experienced delays and have yet even to release their products commercially. Those that do produce CIGS commercially are doing so in relatively small volumes right now. In fact, these companies often argue that their own manufacturing technologies and equipment are what will set their products apart. Centrotherm could change the game if it succeeds because it would allow companies that want to enter the CIGS field to skip making the big investments and come up with their own production know-how. It means shrinking the amount of time it takes to bring commercial products to the market. Would they be the best CIGS modules on the market? Probably not, but in solar cheap wins. "It's an interesting development. If they can drive down costs and improve efficiencies, then of course they will have a competitive product," said Shyam Mehta, a senior analyst at GTM Research. "So many companies have spent hundreds of millions, and they are still in the process of developing commercial viable technologies. Now we have a company that comes out and say we have a turnkey line – I'm skeptical," Mehta added. Nonetheless, standardization, to some degree, seems to already be creeping into CIGS. Last year, Telio Solar built a prototype CIGS manufacturing line for just a few million dollars, bargain basement pricing in CIGS. The company was created by execs from Samsung's LCD unit. Telio keeps cost low by largely employing equipment and processes adopted from TV manufacturing. Similarly, NuvoSun just came out of stealth with equipment harvested from eBay. Centrotherm is better known as a maker of factory equipment for making silicon cells and panels. Silicon cell and panel production involves a fairly mature and standardized process, and new entrants into this business typically purchase equipment from one of a number of factory equipment makers, such as Spire. While it acknowledged that its CIGS business "is still in its infancy," Centrotherm says it has been able to achieve 13 percent efficiency. The company expects its equipment to produce cells with up to 12 percent efficiency in mass production down the road. A commercial panel would be 1.5 square meters. But Centrotherm's own pilot line for research and development is producing panels at 0.1 square meters. The company shipped its first production line to an unnamed customer in Asia. That customer is now testing the equipment at its factory, Centrotherm said. The production line could produce roughly 30 megawatts of panels per year, which, considering the state of CIGS, would be a significant increase in capacity. The Asian customer could start mass production by the end of the year. In February this year, Centrotherm said it has lined up another customer, Illies Renewables in Germany. Illies ordered a 50-megawatt product line worth more than €60 million ($84.8 million) for its factory in Magdeburg-Rothensee, Germany. Centrotherm plans to start delivering the equipment in the first half of 2010. Brian Bartholomeusz, vice president of operations and biz development at Applied Quantum Technology, remembers seeing Centrotherm's presentation on its CIGS equipment back in 2007, the year Applied Quantum was founded. 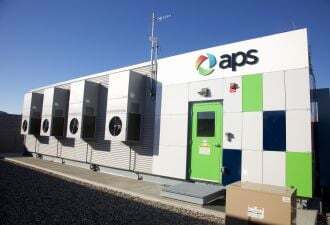 Applied Quantum is developing its own CIGS manufacturing process, but it plans to buy equipment that already can be found in the optical and hard disk businesses and make only minor tweaks, Bartholomeusz said. "I don't think the issue of standardization is a critical one," Bartholomeusz said. "The key issue is whether it leads to scalability and low production costs. I don't think that can be answered yet."